A star sculpture is to be created in a Lincolnshire coastal resort as part of a £250,000 makeover. 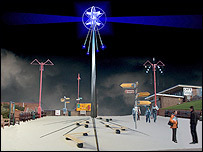 The Star of the East - a 14m (45ft) multi-faceted sculpture - will light up Mablethorpe. The sculpture will form the centrepiece of a series of improvements for the coastal stretch between the town and Chapel St Leonards. New curved benches and historical date lines will also be added to the area, with work completed by summer. The Star of the East's creator, artist Michael Trainor, said the artwork would be a unique feature. "It will have a strong visual presence during the day, become a beautiful beacon of light at night and even has a unique function at sunrise." Further work to the Pullover area of Mablethorpe will include better access to the Seaview car park, with current concrete structures being replaced with seating surrounded by grass. Councillor Peter Leather said: "It is important we invest in our coastal resorts and this is something I'm sure will be of great benefit to those living in the town." Work to improve the area has just started and should be complete in time for summer.